Sadly our dear friend Ann passed away on the 16th August. 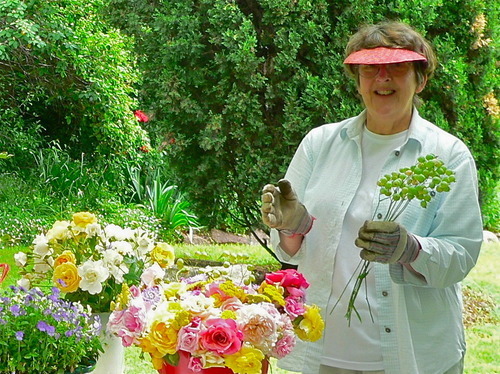 Ann was one of the first selectors in Queensland with Open Gardens Australia, and for close to two decades continued to support the program. She was Regional Chairman, offering her unwavering support and gentle counsel to coordinators and volunteers. And as a further sign of generosity, Ann and her husband David opened their own delightful garden at ‘Loloma’, Dalveen for the pleasure of thousands of visitors. Locally, Ann was a founding member of The Diggers Garden Group, which today, twenty years on, is a thriving community group sharing advice and fellowship. One of the most remarkable seeds Ann planted was the idea that the area surrounding the Kim Walters Choices Program support rooms, at the Wesley Hospital in Brisbane, should be a garden. Now complete, this peaceful, verdant site is a retreat for patients and their families. If we were to describe Ann as a flower she may be a heritage rose: inspiring, hardy, reliably blooming year after year, and always a joy to be near.